Feature 1: High Performance Handling and Aggressive Good Looks. Feature 2: Lower Center of Gravity. Feature 3: Stop Quicker, Corner Faster and get Better MPG! Feature 4: Progressive Spring Design for Excellent Ride Quality. Eibach performance suspension kits are engineered with the will to win. There is no question that Eibach is one of the best makers of street, performance, and motorsports suspension kits in the market. In fact, the Eibach production technology is regarded as the best in the field and is the preferred choice of NASCAR, Formula One, WRC, and Indy Car racing teams. 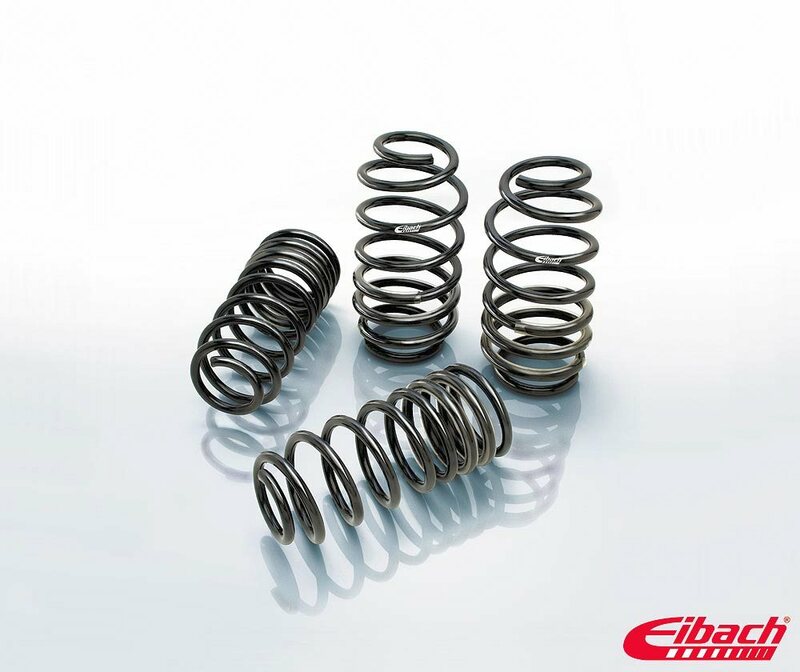 Simply upgrading the factory springs in your vehicle with a set of high-quality Eibach Sportline Lowering springs will completely transform the on-road behavior of your ride. Your car will have better steering response, enhanced cornering abilities, less body roll, and reduced nose dive under hard braking. Eibach engineers are one of the best in the business. They excel in tuning the individual components of the suspension system to achieve the perfect balance of great handling and a comfortable ride. All Eibach springs, anti-roll kits, pro-dampers, and pro-truck shocks are covered by a Million-Mile warranty so you can be assured of the best possible quality and performance. Give your ride the type of suspension that a real performance car deserves with Eibach’s impressive array of performance springs, pro-damper performance shocks, anti-roll kits, wheel spacers, and coilover suspension systems. Truck/SUV owners and off-road enthusiasts should look into Eibach’s lineup of pro-truck performance springs, shocks, lift kits, and sway bars. Eibach will give your rig a better stance and increase the off-road performance without sacrificing ride quality. We at Sam’s Motorsports are proud to carry an impressive lineup of Eibach lowering kits, pro-steering stabilizers, and suspension components for street, track, off-road, and motorsports applications, all at reasonable and pocket-friendly prices. 2009-2016 Hyundai Genesis Eibach Pro-Kit Lowering Coil Springs, The Eibach Pro-Kit Lowering Coil Springs is designed specifically to fit your 2009-2016 Hyundai Genesis without any modification to your beloved Hyundai Genesis. If this Eibach Pro-Kit Lowering Coil Springs is not exactly what you are looking for to accessories your 2009-2016 Hyundai Genesis, please don't give up just yet. Our catalog has huge variety of parts and accessories for your Hyundai Genesis.